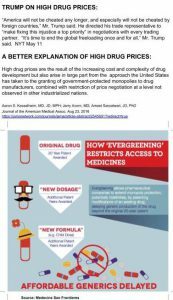 It would be hard to come up with a slimier, more specious argument than the one made by the Trump administration in its pharmaceutical pricing initiative, launched last week. Yes, Trump’s Council of Economic Advisors has found the major culprit in high drug prices: and it is European socialism. The same perpetrators of government-funded single-payer health plans, so beloved by Bernie Sanders and his left wing populist movement, are also the ones who force the parent’s of a dying child pay $20,000 for single pill. The narrative arc of the Trump Drug Price Policy Story begins with candidate Trump’s populist denunciations of high drug prices, and his theatrical scuffles with pharmaceutical executives who somehow crossed him (like the one big pharma executive who resigned from a Trump business council after Charlottesville). There was some hope that POTUS, the erratic narcissistic moron, would stumble onto a tough policy on drug pricing in an impulsive lurch toward his base. So when the White House announced the new policy last Friday, the unsurprising twist in the story was Trump pulling back on campaign promises and pivoting in the direction of the pharmaceutical industry, no doubt under the guidance of the former big Pharma executives now running tTrump drug policy. Of course it’s complicated. In fact, anyone who has ever tried to file a claim with a health insurance company knows that sheer complexity is a major contributor to the cost and dysfunction of our health system. We obviously need enough patent protection in place so that drug companies have strong incentivea to invest in research and development. The role of government payers like Medicare and Medicaid no doubt leads to inefficiency and abuse. But the real root of insane drug prices is an insane level of political power in the hands of the pharmaceutical industry, which is then abused to restrain competition. The pharmaceutical/health industry spends more on lobbying — by a lot — than any other industry. They spent $279.6 million in 2017 — #2, insurance, spent only $160.2 million (opensecrets.org). Interestingly, pharma spends less on campaign contributions than other industries — only $22.1 million so far for 2018, ranking a paltry #18 in the industry contribution ranking (I wonder why? Better to buy politicians after they’re elected?). Pharma’s influence was famously and starkly demonstrated when the industry’s massive lobbying campaign successfully pressured the Obama administration and a democratic congress from adding major provisions to Obamacare that would have dampened the sharp increase in drugs prices. Now crony capitalism has reached new and obscene heights under Trump. Scott Gottleib, Commissioner of the Food and Drug Administration, came to the job after serving on pharmaceutical company boards and as a highly paid industry consultant. Alex Azar II, sec. of Health and Human Services, came from Eli Lilly. So what better way to turn attention away from this pitiful morass of corruption other than to blame the French?